Professor Eugene Wang presented his lecture “What to See in a Buddhist Cave?” to around 40 people at the C. K. Choi Building on November 30, 2011. Professor Wang began with a summary of the Dunhuang Caves, which are famous for their distinctive Buddhist murals and sculptures. Each cave had a specific layout inviting the visitor into a Buddhist “world”–complete with a central column, statues of buddhas, and murals on the walls and ceiling. Murals often portrayed the previous lives of the Buddha (Jataka tales) and the final moments of the Buddha’s life. Used to illustrate the operation of karma, some portrayed beings emerging from Buddhist hells and predictions of their future births. Prof. Wang concluded that the caves themselves guide the visualization practice of those who enter them: from awakening to the truth of karma and rebirth, to repenting evil acts from a myriad of previous lives, to finally becoming a buddha. 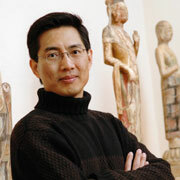 Professor Eugene Yuejin Wang is the Abby Aldrich Rockefeller Professor of Asian Art at Harvard University. He was born in Jiangsu, China, completing his graduate studies at Fudan University in Shanghai (M.A. 1986) and at Harvard (Ph.D. 1997). He is also the Art History associate editor of the Encyclopedia of Buddhism (2004). His book on Shaping the Lotus Sutra: Buddhist Visual Culture in Medieval China (2005) has received the Academic Achievement Award in Japan. His articles have been published in The Art Bulletin, Art History, Critical Inquiry, Res: Journal of Anthropology and Aesthetics, Public Culture, and elsewhere, and cover a wide range of subjects including ancient bronze mirrors, Buddhist murals and sculptures, reliquaries, scroll paintings, calligraphy, woodblock prints, architecture, photography, and films. UBC’s Buddhism and Contemporary Society Program events are made possible by the generous support of The Tung Lin Kok Yuen Canada Foundation, in collaboration with the Institute of Asian Research and Department of Asian Studies.